Hello fellow Playmobil fans I know it's been a while since I've posted some things but I felt I need to explain some stuff to my visitors. First of all and of greatest interest to most of you, my latest project the Disney Hotel is almost finished and I will have lots of photos up next month. This is a system X building and one of the largest ones I've built so far so I hope you enjoy looking at it :) I've not given up building Playmobil things yet! Secondly and most importantly to me I'd like to explain a few things about my work. I regularly get asked to build houses or make carriages and some people are surprised at the costs. I'm not trying to rip people off or charge stupid prices for things but I don't think a lot of people realise the rising costs of parts and materials involved so I thought I'd explain a little of whats involved in a couple of different projects. This is the Victorian horse drawn bus I've only built 2 so far yet it is one of my most asked for vehicles, in fact I was asked for one today which is what has set this blog post off. If Playmobil made a carriage like this I guess they would be able to do it for around £35 based on the large princess carriage being £22 and I, like you would say that was a reasonable price. But for me it costs a lot more, I went on ebay today where I get most of my discontinued Playmobil to price up the parts. Keep in mind nearly everything I build if it's Victorian is from rare discontinued parts that haven't been made for about 10 years. So this bus is made from a train carriage, a stage coach and an aeroplane! The only train carriage on there was £40, plus a carriage for the base about £15, plus the seating if I could get it as spares maybe another £10. So that's £65 without me doing a thing. Now add to that the costs of paint, glue, figures, material etc and your getting close to a £100, never mind the time it takes for me to build and paint all this. This is why I've only ever done 2 of these. I had managed to get the parts before really cheap with other items, because to me £100+ is too much to pay for a bus, I wouldn't pay it and I wouldn't ask anyone else to either. But this shows how much even a simple item can cost. Now think on how much Victorian house parts are, a second hand wall is about £6-8 not including shipping it soon adds up! Most secondhand houses have parts missing and as it's always the same parts gone, those replacements have risen with the demand, e.g. £2 for a railing post, £1.50 for a base clip. The average price of basic furniture sets has almost doubled in price recently. So why not build things from new modern parts your wondering, if it's still available then it's got to be cheaper right? Not always I wish it was. This is the arched doorway from the new 5142 Palace, I've just changed the doors on it to those from the farm. Nice isn't it ? 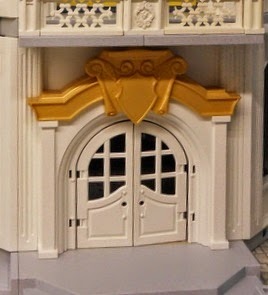 I've used these on my Disney hotel and they look great but because no one sells these as second hand spares I had to get them directly from Playmobil at £10 for that doorway wall it's cost me £60 just for the 6 main doors I've put into that building alone. Disney is 2m long 3 floors tall and has 46 windows to give you an idea of size and it's taken 5 months to design and build, when you see the finished building you can have a better guess at the costs involved in making such a large item. Now I've just mentioned how long it's taken to make the Hotel because that's the other major thing involved with my work and that's the time taken to do it. I haven't got a little factory here or expensive machinery, it's just me with a hand saw, some clippers and paint brushes basically. Everything is hand cut and painted. This all takes time, a lot of time if it's a house, even small things like a customised figure can take several hours to do. I work and have a family and have other interests so making a figure can use up my evening. So you see when you ask about how much a house is to buy I can't compete with a company like Playmobil, I don't mass produce to keep the costs down like them, every piece is an individual hand crafted item and I think fairly priced based on the current costs and labour involved to produce.